Maria Grace has been an important name in the Jane Austen community for many years. She has written several fiction books and novellas celebrating our dear characters from Pride & Prejudice, but also some non fiction works where she shares with us the costumes in regency, namely A Jane Austen Christmas: Regency Christmas Traditions and Courtship and Marriage in Jane Austen’s World. 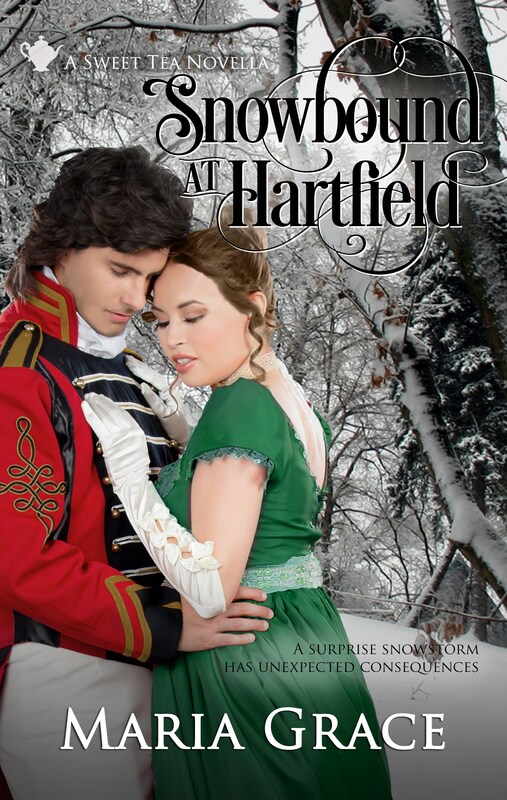 Apart from all her work in JAFF, she has always been a dear author and I am very happy to interview her today regarding her recently released book: Snowbound at Hartfield. I hope you enjoy this interview but if you still have any question that you would like to see answered, please do not hesitate to ask it in the comments. I’m sure Maria will be glad to answer you and it will enter you in the giveaway she is hosting. Hello Maria, welcome to From Pemberley to Milton. I know you have just released a new book called Snowbound at Hartfield. What can you tell us about it? What can readers expect? Maria Grace – Snowbound at Hartfield is a romance about second chances and the difficult reality single adults, men and women, faced in the regency era. Even though it deals with some difficult subjects, there’s a generous helping of humor and lots of warm fuzzies as well. FPTM – This book is a mash up of several Austen stories, and even though I’ve seen crossovers between two different Austen books, I never saw one putting together characters from three different books. How did you come up with this idea? MG – The idea for Snowbound came out of a March Mash-up Madness theme we had last year at Austen Variations. FPTM – But why Emma, Persuasion and Pride and Prejudice? MG – One of our readers suggested a scene between some of the Austen fathers, like Mr. Woodhouse, Mr. Bennet and Sir Walter Elliot. I took that idea and ran with it. By the time all was said and done, Snowbound was the result. FPTM – The book is written from 2 different points of view and one of them is Miss Elizabeth Elliot from Persuasion. She is hardly ever seen in JAFF and I had never seen her as a main character, why did you decide to give her the spotlight on this novel? MG – That came out of having Sir Walter Elliot as one of the fathers in the mash-up scene. I couldn’t imagine him traveling without company of some kind, and what more natural company for him to have that the daughter who still lived with him? FPTM – Miss Elizabeth Elliot is a controversial character, what is her story on Snowbound at Hartfield? How did you decide to approach this character? MG – We pick up Miss Elizabeth Elliot after she has had two very difficult experiences. First, the heir presumptive of the family, William Elliot has taken her friend, Penelope Clay ‘under his protections’–which is to say he has made her his mistress. Worse yet, she is living in his house, which was just not done. All this happened while Elizabeth was expecting an offer of marriage from him. On top of that humiliation, her younger sister Anne is married to the very desirable Captain Wentworth, leaving Elizabeth, the eldest sister who should have been the first to marry, the only one left unmarried. So, Elizabeth is an humiliated spinster, whose financial situation requires her to live with her foolish father. In such a situation, she would be the mistress of the house, handling the management aspect of this home. With little money to work with, it would have been very challenging to live the lifestyle of a baronet, as her father would have required. Living through all would tax anyone. To me, it seemed the perfect motivation for potential personal change, so that’s where I wrote her from. FPTM – The other POV in this book is Col. Fitzwilliam whose character also takes an interesting turn in with a different side of him being explored. What can you tell us about his character? MG -I think Col. Fitzwilliam is a complicated character. As a military officer of the era, he would have seen action in the Napoleonic wars. Those wars were brutal and horrific and it is hard to imagine a man who could experience that without some lasting effects. Those experiences impact him greatly, and leaving himself feeling ‘less’ than the man he used to be. That is part of the challenge he faces in this story. FPTM – Thank you so much for letting us know more about Snowbound at Hartfield Maria. Is there anything else you want to tell my readers? MG – Snowbound started as a bit of a lark, but the characters had a story to tell and wouldn’t leave me alone until I had allowed them to tell it. It didn’t end up to be the story I expected it to be, but after all was said and done, I’m very happy with the results. Maria Grace has offered a giveaway of an ebook of “Snowbound at Hartfield for my From Pemberley to Milton readers. To enter it please leave a comment on this post until the 1st of March, and if you want to double your chances of winning, comment the review that will be posted here on the 23rd of February. The winners will be announced in the beginning of March. To make sure you receive the winners announcement notification please follow From Pemberley to Milton to make sure you receive an e-mails every time a new post is published. I would hate to see someone didn’t win the book because they missed the announcement. This was a very touching story. I think Maria got both Elizabeth and the Colonel just right! I already own the e-book so don’t enter me in the giveaway. Wow! Neat how the story came about from a mash-up and reader’s idea. I love the idea of story with Miss Elliot and Col Fitz. Having seen some of Maria’s posts, I am not surprised that she took a reader’s suggestion and turned into a book. Such vivid writings detailing life in years long ago. Congratulations. Love all of your books! Can’t wait to read this one! The Colonel is perhaps a little peeved that he has yet to marry,while Elizabeth is stuck in a rut,forced to listen to the grandiose remarks of her father,a man who has a bizarre relationship with the reality of the situation he now finds himself in. I think it’s a very clever idea and the fact that we are privy to the two perspectives frees us to sympathise,in a way,with both parties. Sincere thanks to you,Rita,and Maria for the opportunity to win a copy of the book. Great interview. Love mashup stories so added to my wishlist. I have read some of this story as it has been posted and enjoyed it. I never liked Elizabeth Elliot but can see how in the circumstances her character might have improved. Plus her forced economising would be a definite accomplishment as far as the Colonel is concerned. And Darcy and Elizabeth are there as well so that is a plus. I would love to win a copy of this book so thanks for the opportunity. Maria, may I know what will be your next project in the Sweet Tea series? I am curious to know. Thanks for the fascinating interview ladies. I love finding out how stories come about. This one, while relatively short, is just lovely. Maria Grace manages to get us rooting for a previously unsympathetic character, just a she did with Lydia Bennet in The Trouble to Check Her, and has done it very well once more. Of course, it helps that one of everyone’s favourite minor characters, in the shape of the Colonel, is there too. I don’t think I’ve seen him written in quite this way before, either. Definitely one for the Wish List for those who haven’t already got it or aren’t lucky in the giveaway. I’ve already got a copy, Rita, so please don’t put my name in the hat. I always enjoy Maria’s books and I am looking forward to this one. Wonderful interview. Thank you for the giveaway. I will be starting this book today after work, and I can’t wait. Great interview! No need to enter me in the giveaway. I’ve read quite a few Jaff where a not-so-appealing character has been made sympathetic, and I’ve enjoyed them. However, I am not inclined to like Elizabeth Elliot, because she is just so self-centered and spiteful. I am looking forward to seeing how you deal with her, and hoping that I am pleasantly surprised in your treatment of her. I have read a few of Maria’s books and loved them all. So I would really like the chance to read this new one. Please count ne in, thank you! Love your books! This one sounds as good as the rest, can’t wait to read it! I followed this as Maria posted chapters but it is one I want to purchase and read the finished product. It was interesting reading about Elizabeth Elliot being of interest to the colonel. I had a difficult time bringing myself to like her as canon and variations do not paint her as at all likeable. Thanks for sharing.